Histology And Cell Biology : Deja Review - ubiq bookshop: the best place to buy books! Maximum retention in minimum time! These 'flashcards in a book' help you remember high-yield facts in the least amount of time possible. Drawn from the perspectives of recent graduates fresh from their medical school and USMLE experience, "Deja Review" books focus specifically on what is essential for success on your course exams and the USMLE. The key features of the book include: active recall Q&As facilitate real learning, not just memorization; vignettes at the end of each chapter put the material in clinical context; mnemonics and key words help you focus on core facts; content works in conjunction with larger course books; and portable size makes them great for study on the go. 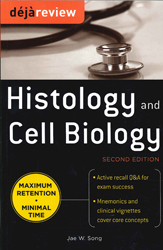 It also features everything you must know about Histology and Cell Biology to ace your exams: Connective Tissue, Bones and Cartilage, Blood, Muscle, Nervous System, Cardiovascular and Lymphatics, Respiratory System, Endocrine, Skin and Glands, Digestive System, Hepatobiliary System, Urinary System, Female Reproductive System, Male Reproductive System, Senses, Cell Membrane, Cell Nucleus, Genes to Proteins, Molecular Biology Techniques, Organelles, Vesicle Transport Cell Cycle Division, Extracellular Matrix and Cell to Cell Interactions, Cell Receptors, and Signalling Pathways. Featured in the May 2011 Mostly Medical newsletter.